Located directly south of Carbucks of Delaware, Inc’s. Newark, Delaware location, Baltimore, Maryland is the largest city in Maryland and the main economic engine for the state. The metropolitan area has a population approaching 3 million people. Its large working seaport as well as revitalized inner harbor area make Baltimore a vibrant city. 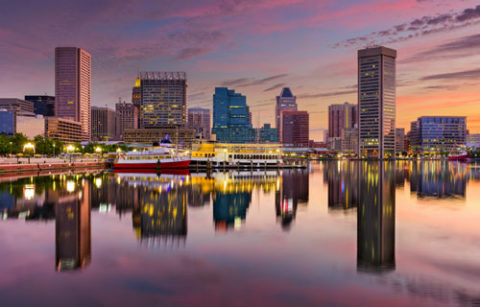 The inner harbor area offers shops, restaurants and attractions. Baltimore is known for its hundreds of individual neighborhoods, all with their own identity. An easy drive straight up I-95 to Newark, DE makes Carbucks of Delaware, Inc. the prime car title loan business for those in the Baltimore area. We specialize in title loans for cars, trucks, commercial vehicles, and semis. Our office is in Newark, DE, on Elkton Road just north of Elkton, MD right off I-95. Please contact our office dialing 410-545-0595. You may also complete the short form below and an experienced Carbucks loan manager will give you a call. Carbucks can serve your Car Title Loan and Car Title Pawn needs at our local retail offices in: Fort Mill, SC office; Landrum, SC office conveniently located in the Greenville, SC/ Spartanburg, SC, SC area; Norcross, GA office conveniently located in the metropolitan Atlanta, GA area; Kingsland, GA office conveniently located to Jacksonville, FL / Daytona, FL / Gainesville, FL; our Newark, DE office conveniently located to Wilmington, DE, Elkton and Baltimore, Maryland; Services are not available to Pennsylvania residents. *Certain restrictions apply based on particular state laws. Carbucks lends money based on the value of your vehicle and your ability to repay. ©	2009-2019 Carbuckscorp.com | All Rights Reserved | National Toll Free Hotline 1-800-910-7187	Website Design by Digital Eel Inc.